On Debut, Shannon Gabriel gets out on the first ball of the day. There was the best possible start for England as Shannon Gabriel was picked up off the first ball of the day, meaning that Stuart Broad finished with a Test-best 7-72. 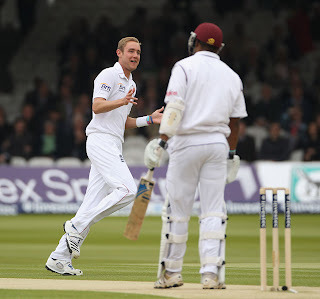 Chanderpaul's tactic of exposing the tail-enders to the strike was cruelly exposed as he finished high and dry. Andrew Strauss came into this innings under considerable pressure and he answered all his detractors in the best way possible, stroking an unbeaten 121 as England moved comfortably onto 259-3 at the close of play. The West Indies bowlers never looked threatening as the three wickets to fall were more mistakes by the batsmen rather than brilliant deliveries; Cook played on, Trott tried to drive a ball which was too short and Pietersen managed to nick behind a long hop from the innocuous Marlon Samuels. Pietersen's dismissal was the most galling, given the quality of the attack and the constant excitement whenever he is at the crease. All three of them got in, but only Strauss made more than Trott's 58. Despite these setbacks England are well in the driving seat and and should try to push on to get a lead of over 200 tomorrow.